Rangerover EVOQUE. ANY PERSONALISED PLATE. Great Die-Cast Model,Gloss BURGUNDY RED Paintwork,with opening front doors, alloy wheels effect, rubber tyres,nice clean lines Great Model! just like the real thing! MPN: 43698F. Manufacturer: Welly. Range Rover Sport in orange. Not suitable for children under 3 years. Scale: 1:38. Nice interior. NEW SHAPE RANGE ROVER SPORT. Pull Back & Go! THIS IS THE LATEST RELEASE & B. 4.5" (117mm) in length. ANY NUMBER PLATE YOU WANT. Range Rover EVOQUE. ANY PERSONALISED PLATE. Great Die-Cast Model,Gloss WHITE Paintwork,with opening front doors, alloy wheels effect, rubber tyres,nice clean lines Great Model! just like the real thing! Opening bonnet reveals beautifully detailed engine bay and opening front doors reveal a detailed interior! A truly lovely model! 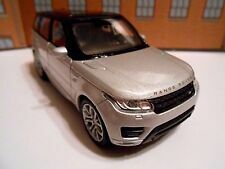 Silver RANGE ROVER SPORT Toy Car MODEL boy dad girl BIRTHDAY present gift NEW! Nice interior. NEW SHAPE RANGE ROVER SPORT. Pull Back & Go! THIS IS THE LATEST RELEASE & B. 4.5" (117mm) in length. 5 out of 5 stars - Silver RANGE ROVER SPORT Toy Car MODEL boy dad girl BIRTHDAY present gift NEW! 27 product ratings27 product ratings - Silver RANGE ROVER SPORT Toy Car MODEL boy dad girl BIRTHDAY present gift NEW! RANGE ROVER SPORT. Die Cast Model with Plastic Parts. Scale 1:24. Car is new in unopened box. With opening doors and "pull back and go" action. model length = 11,5 cm (4,50") / Box: 16 X 7 CM. 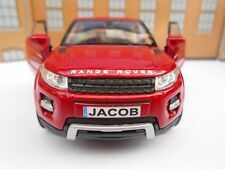 RANGE ROVER SPORT Toy Car MODEL boy dad BIRTHDAY present gift NEW!! Great Die-Cast Model,WHITE Paintwork with Opening front doors, alloy wheels effect, nice Range Rover badging, good light detail, just like the real thing! nice interior. NEW SHAPE RANGE ROVER SPORT. MPN: 43698F. Manufacturer: Welly. Range Rover Sport in white. Not suitable for children under 3 years. Scale: 1:38. MPN: 24059. Manufacturer: Welly. Range Rover Sport in White. Scale: 1:24. Quality detailed diecast model for collectors. Manufacturer: Welly. Land Rover Range Rover Evoque in Dark Red. Not suitable for children under 3 years. Scale: 1:34-39. Quality detailed diecast model for children and young collectors. TOY CAR RANGE ROVER SPORT MODEL TOY CAR BOY GIRL DAD BIRTHDAY GIFT NEW & BOXED! Item for sale. Range Rover sport. Features. Pull back & Go / opening doors. Scale. 1/34-1/39. TOY CAR RANGE ROVER SPORT MODEL TOY CAR BOY GIRL DAD BIRTHDAY GIFT NEW! Item for sale. Range Rover sport. Colour. White. Features. Pull back & Go / opening doors. Scale. 1/34-1/39. The box has been opened and both door mirrors are missing. But the model itself is in new condition other than that as far as we can see. It is incredibly rare and we have only one for sale. Made by Welly this beautiful diecast model model is strongly made and includes. White & Black Range Rover Sport. 1:24 Scale Model. 2 Opening Side Doors. Opening Bonnet. Ideal model for your desk or owner/enthusiast/collector. Presented in a cardboard display box with window. so don't miss out - order now. 24021 Range Rover Evoque white. 1/24 Scale Die-cast model by Nex Models. RANGE ROVER SPORT (White Black Roof) with 'Pull Back and Go Action' and 'Opening Doors'. Scale Model - From 1:34-1:39 Range (Approx. 11cm Long). Auctiva's FREE Counter. 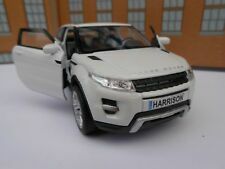 Diecast Range Rover Evoque white, Welly 43649, scale 1:38, model toy car gift. Condition is New in an unopened box. Dispatched with Royal Mail 2nd Class £2.95. Manufacturer: Welly Scale: 1:38 Length: 110 mm Condition: Brand new in unopened box. Additional information: With OPENING DOORS & PULL BACK ACTION. Not suitable for children under 3 years. Ideal gift. VERY REALISTIC - GREAT QUALITY - PULL BACK AND GO ACTION (FRICTION). Personalized number plates included of your choice. FAVOURED SHINY WHITE COLOUR! Pull back and go feature. Ideal gift for children or adults alike. A lovely detailed model. This item would make an excellent addition to your collection and a fantastic display piece. Captain Scarlet. The Beatles (Music Band). 1/43rd Scale. 1/24th Scale. 1/18th Scale. Silver & Black Range Rover Sport. Authentic white front number plate and yellow rear number plate. Pull back and go action - watch it whiz across the floor. Scale Model. 2 Opening Side Doors. Movable wheels with rubber tyres. Die cast 4 Wheel Drive Collection. Mitsubishi - 1/42 SCALE-CHINA. BMW - POLICE-1/42 SCALE-CHINA. FORD EXPLORER- MAISTO - 1/42 SCALE. Land Rover RANGE ROVER EVOQUE. Die Cast Model with Plastic Parts. Scale 1:24. Car is new in unopened box. Approximate scale: 1/64 (model length 7 cm ). 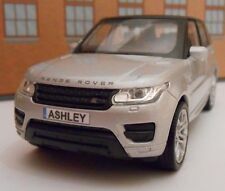 TOY CAR RANGE ROVER EVOQUE MODEL TOY CAR BOY GIRL DAD BIRTHDAY GIFT NEW & BOXED! Item for sale. Range Rover Evoque. Colour. Burgundy. Features. Pull back & Go / opening doors. Scale. 1/34-1/39. (WELLY / NEX. RANGE ROVER EVOQUE. RANGE ROVER BADGE & LOGO. PULL BACK & GO. OPENING DOORS. HOT WHEELS MODELS "1.64"). WHITE PLATES BACK AND FRONT. VERY NICE GOOD SIZE MODEL. Pull back and go action - watch it whiz across the floor. Scale Model. 2 Opening Side Doors. a unique gift. so dont miss out - order now. Welly Collection 1:38 Scale (It. Land Rover Range Rover Evoque 3-Door - White. This item is new & boxed (box has slight storage wear). Model has opening doors & 'pull-back-and-go' motor. Note that the cost for this is included in the rate you see. ). They are a good heavy model at a third of the price of the upper end models. you either leave them in the display box or have the model on a shelf or desk. AVERAGE PRESENTATION BOX SIZE - 230 x 110 x 100 mm (over 25 mm thick so has to go as a small parcel). Range Rover Sport Chilli Orange. 1/24-27 Scale Die-cast Model by Nex. 1/ Scale Model by WELLY. Browse All Categories. SPARES or REPAIR - The item will be in a poor condition. Add to Favourites. Our aim is to ensure no matter what the model, we will provide an excellent service experience. Burgundy Land Rover Range Rover Evoque. Quality diecast with plastic parts. Pull back and go action - watch as it whizzes across the floor. 2 Opening side doors. Suitable for Age 3 years. Great model for your desk. Manufacturer - Welly. Model - Range Rover Sport in Red / Orange. Scale - 1:24 (approx 18cm). 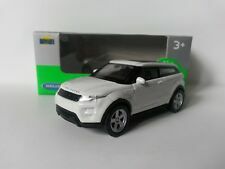 Range Rover Evoque Model Car. Product specifications are given but it is up to the end user to ensure that the product is fit for that purpose. Part Number: DA1222. Part numbers are used for identification purposes only and do not imply or indicate the identity of a manufacturer. Nicely detailed model of the Range Rover Sport with alloy wheels sunroof and black interior. It is made by Welly and is 1:24 scale (approx. 17cm / 6.7in long). 1/24 scale. WELLY DIECAST MODEL. With opening doors and pull back action. Land Rover Range Rover Evoque in white. This again varies depending on location and size and total weight. Bank cashing cost this end. 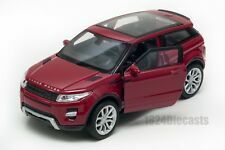 Diecast Car Model Welly FX Models Range Rover Evoque 1:24 (Red) + GIFT!!!! Diecast Car Model Welly FX Models Range Rover Sport 1:24 (Orange) + GIFT!!!!! 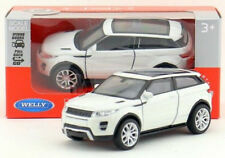 Diecast Car Model Welly FX Models Range Rover Evoque 1:24 (White)+ GIFT!!! !